Whether on the garage or shed or in the entrance area: the Battery LED Spotlight makes it really straightforward to illuminate dark corners around the house. The spotlight is easy to install and not dependent on connection to the power supply thanks to battery operation. The integrated motion sensor detects within an area of seven meters. The robust plastic housing in white or black blends unobtrusively into the architecture. These robust outdoor luminaires operate completely independently of the mains power supply thanks to solar panel and battery operation. They store solar energy during the day and illuminate at night time with 20% of their light output initially. Only when the integrated sensor detects motion does it switch to full output (approx. 320 lm) for 30 seconds. The battery-operated entryway luminaire DoorLED Down receives guests with a powerful, cool-white cone of light, giving you added safety and security in the stairwell or at your front door. The modern luminaire also scores points with its integrated day/night sensor and motion detector, ensuring it only switches on when light is needed. The DoorLED Down LED luminaire is easy to install on practically any surface and is also weatherproof. Batteries are included in delivery and you can choose between either a white or a silver-colored casing for your luminaire. Two are better than one! Which is why the battery-operated entryway luminaire DoorLED UpDown shines two cones of bright light to illuminate the area near the front door effectively, so you can see both the doorway and the surrounding area easily. The low-energy LED luminare is weatherproof and therefore ideally suited for outdoor use. 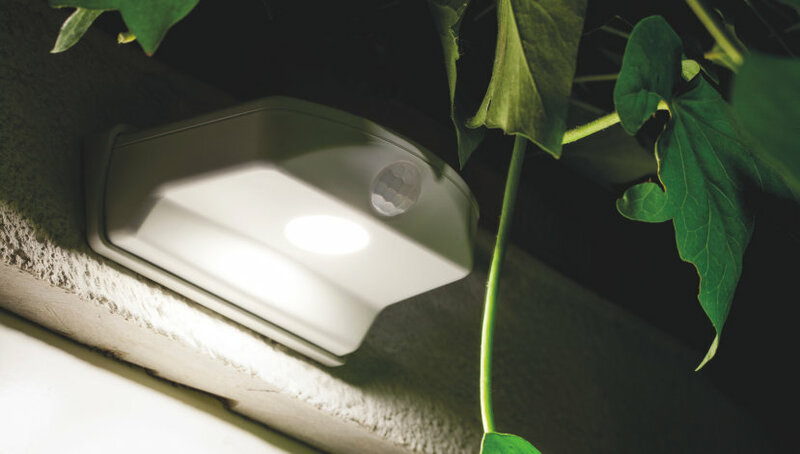 The luminaire also includes a day/night sensor and a motion detector for additional convenience. The DoorLED UpDown luminaire is extremely easy to install on just about any surface, and batteries are included. This product comes in a choice of white or silver exterior. Thanks to its integrated motion sensor, the battery-operated DoorLED provides a welcome greeting in areas where there is no mains connection: ideal for cellar, attic or gardenshed. DoorLED is secured with the supplied mounting screws or double-sided tape.